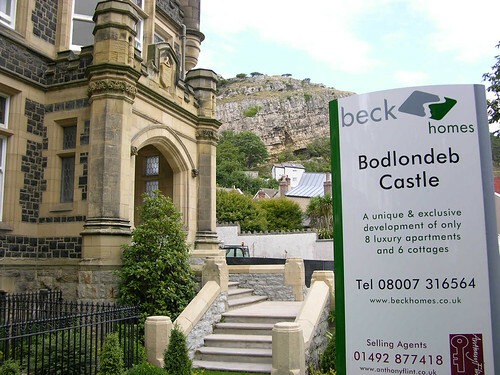 Bodlondeb Castle (situated next to the Tram Station on Church Walks) is one of Llandudno's more ornate buildings, being a castellated building built in the Scottish Baronial style. Its interior contains several fine stained glass windows, together with many examples of Italian craftsmanship reflecting the baroque period including a baronial hall, translucent marble pillars and a magnificent staircase together with gothic masonry. 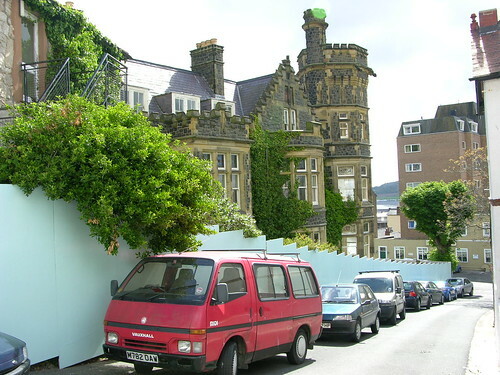 In 1897 , a very wealthy guest at the St. George's Hotel (who wished to remain anonymous) was so taken with the delights of Llandudno that he instructed the Hotel's Manager, Mr. Thomas Davies, to build a residence for him in the town. The guest's only wish was that the finest materials be used in its construction. Mr. Davies was happy to comply with this and, besides engaging the local builders, Jones & Son, also arranged for Italian craftsmen to come over to work on the decorative elements such as the marble columns in the main hallway. The stained glass windows in the main rooms represented the coats of arms of the heads of the fifteen tribes of North Wales. Mr. Davies was very pleased with the standard of the construction and felt that his client would be too. The day came when the wealthy client returned to Llandudno to view his new residence. The client viewed the exterior of the property, then looked around and asked 'where is the land?' Upon being told that there was no land associated with the property other than a very small garden, he declared that he was no longer interested, turned around and left, never to return! Local rumour once had it that the wealthy guest was none other than Edward the Prince of Wales (later Edward VII). 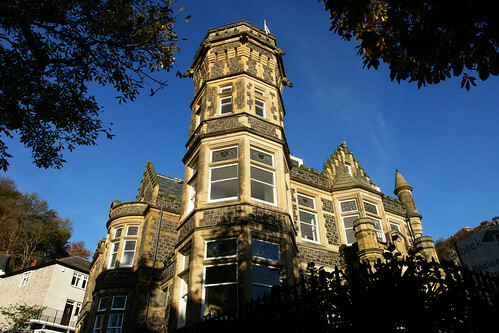 The property then remained in the Davies family until 1931, when they sold it to the Methodist Holiday Homes Ltd, who opened it as a Methodist hotel and it remained as such for many years. The Chapel building (now cottages) at the rear of the Bodlondeb Castle, Caer Salem, closed in 1934 and was purchased by the Methodist Holiday Homes to form an annexe to the hotel. During World War II, around 30-40 Civil Servants were billeted in the hotel, although it also managed to remain open for guests. In 1954, a set of modern garages were built and a Games Room was added above the garages in 1967. Sadly, business began to decline sharply during the early years of the 21st century, with the occupancy rate for the 20 bedrooms falling to 32%. It closed in 2005 after being on the market with a firm of specialist commercial agents for 18 months, but no firm offers approaching the £650,000 asking price were received. It was purchased by Norwest Developments/Beck Homes, who announced plans to restore the building and convert it into 8 luxury apartments. Work started in late 2005 and great care was taken to restore the original features of the building, whilst removing later additions, such as the garages and games room. It would be nice to see the stained glass windows containing the coats of arms. I'm told that I'm descended from one of the noble families. An interesting piece of the town's history - thanks. Interesting to read your side-comment about 15 'tribes' of north wales, all sophisticated enough to have a coat of arms each! Was this a bit of poetic licence? (it's so easy to spend someone else's money! ), do you think?. Do you (or someone else) have the details?